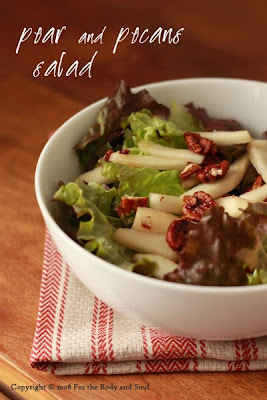 The Pear and Pecan salad recipe is my own creation prepared for Nut Weekned, a Polish food blog event hosted by Ela from My Best Food blog. Preheat the oven to 350°F (170°C). Line a baking sheet with parchment paper. In a bowl combine the nuts with olive oil, honey, maple syrup and spices. Spread on prepared baking sheet. Bake until golden brown, 12 to 15 minutes, stirring occassionaly. Remove from the oven and let cool completely. Place all the dressing ingredients in a jar. Shake until well combined. Wash and dry the lettuce, if the leaves are big tear them into pieces. Peel, core and cut the pear either in cubes or strips. Divide the lettuce leaves into four plates. Sprinkle with pieces of pear and nuts. Pour the maple dressing over the salad and serve immediately.